It’s that time of year, again, when those nasty old hornets, wasps and yellow jackets start buzzing around, intimidating and sometimes hurting us. Ouch! Here’s an old home remedy used by beekeepers for eons. You might give it a try, if you do have the misfortune of feeling the sting. Raw onion. 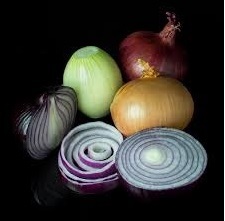 Grab a raw onion from the kitchen, cut a nice, wide slice and hold it right over the sting. It soothes the pain, relieves the itching and swelling and draws the stinger out of your skin. Amazing! BTW, did you know bees are attracted to yellow? good one! We are raising bees now. Toms bee suit is white, not yellow so far no stings. But an onion is always available. Good to know.